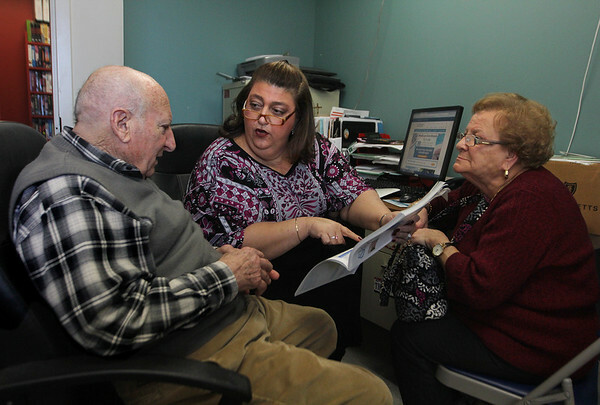 Gloucester Mayor Sefatia Romeo Theken, center, helps Carmen and Antonette Palladino navigate the health insurance system Friday afternoon at the Rose Baker Senior Center. Romeo Theken, who is serving as interim mayor for the rest of former mayor Carolyn Kirk's term, said she still volunteers in her spare time as a SHINE counselor because of the overwhelming need in Gloucester. SHINE (Serving the Health Insurance Needs of Everyone) is a state health insurance assistance program providing free insurance counseling and assistance to residents with Medicare and their caregivers.